Sridala Swami’s poetry and fiction has appeared or is forthcoming in various journals including Wasafiri, Asian Cha, Desilit and Drunken Boat. 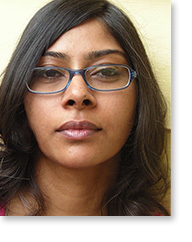 Her work also features in The Bloodaxe Book of Contemporary Indian Poets (ed.Jeet Thayil, UK: Bloodaxe, 2008); in Not A Muse Anthology (ed. Katie Rogers and Viki Holmes, Hong Kong: Haven Books, 2009) and in First Proof: 4 (India: Penguin Books, 2009). Swami’s first collection of poems, A Reluctant Survivor (India: Sahitya Akademi, 2007, rp 2008). She has written three books for very young children, which were published by Pratham in 2009. She lives in Hyderabad, India. Swami blogs at The Spaniard In The Works.